The Cambridge Analytica privacy furore brought increasing pressure on Facebook to reexamine its privacy settings and to make it easy for users to control the extent to which third party apps can access their data. 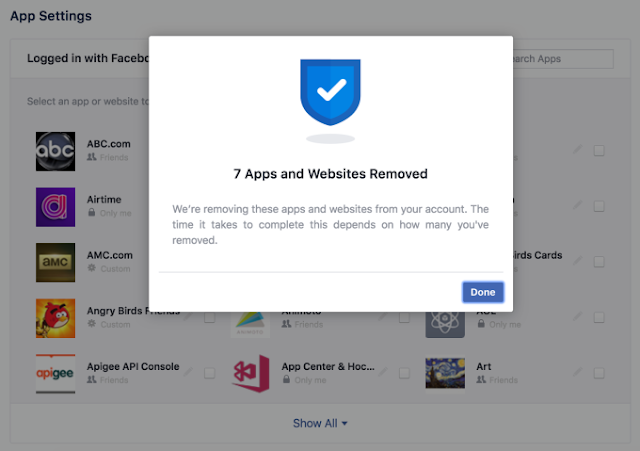 Now Facebook has responded by releasing sets of tools aimed at tackling the privacy rows, with a bulk deletion tool which removes third party apps permission, instead of the former instance of removing them one after the other. Facebook users can simply tick the apps they want to get rid of and click "remove" to have them deleted at a go, which tool can be found at the settings menu and navigating to "apps" then you'll have the options. As part of its steps to thwart abuse of users data, it will conduct a full audit of any app with suspicious activity, with a ban penalty for any developer on the platform that does not agree to the audit. Further more, Facebook will restrict the apps access to users data to prevent abuse, and it will remove developers' access to users data if they haven't used their app in 3 months. Facebook will going forward require all developers to not only get approval but also sign a contract in order to ask permission from users to access their posts or other private data. The third party apps management tool will eventually be made available to every user at the top of their News Feed with the apps they've used and an easy way to revoke those apps' permissions to their data.